“Philetas’s Orchard” (1961), Marc Chagall. From the Daphnis and Chloé suite. On display at Park West Museum. Bob Dylan once said that “passion is a young man’s game,” but over 60 years ago, at the age of 55, famed artist Marc Chagall illustrated one of the greatest young love stories of all time—the Greek legend of Daphnis and Chloé. Considered one of the quintessential artists of the 20th century, Chagall defined a new generation of figurative artists by envisioning optimism, empathy, and resolve within his work. Those qualities permeate his passionate depictions of the two Greek lovers, which perfectly capture the fiery longing of a new romance. Amazingly, the project originated as the artist was preparing for his own second honeymoon. “Temple and History of Bacchus” (1961), Marc Chagall. From the Daphnis and Chloé suite. On display at Park West Museum. 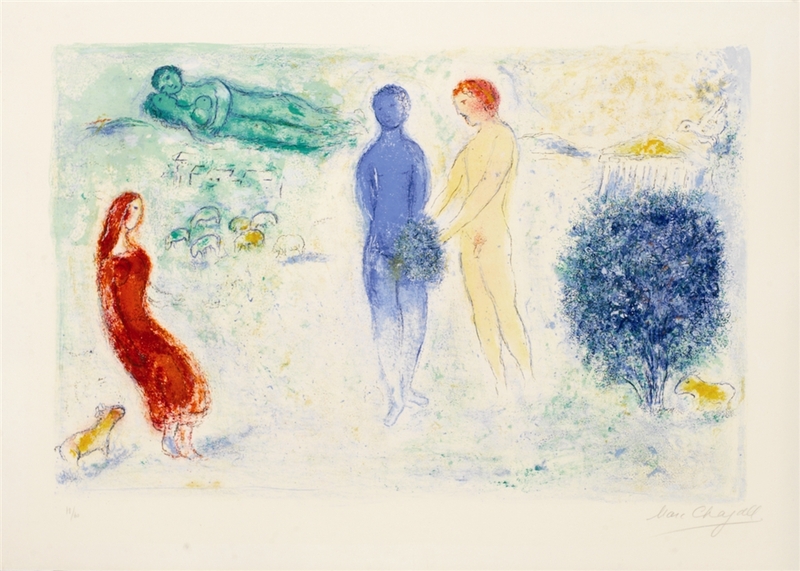 In 1952, the publisher Tériade reached out to Chagall to see if he might be interested in creating a series of lithographs based on the Greek poet Longus’ retelling of Daphnis and Chloé. The timing of the request was uncanny. Chagall had recently met and married his second wife, Valentina Brodsky, and was touched by the romantic tale of love conquering all. Chagall spent the next nine years creating 42 color lithographs conveying the famous love story, using his honeymoon locations of Delphi, Athens, and Poros, Greece as his inspiration. The story of Daphnis and Chloé recounts the journey of two soulmates who begin life as orphans on the Greek Isle of Lesbos. Raised by local farmers and shepherds, the two orphans grow up together, tending to their adopted parents’ livestock. As they mature, Daphnis and Chloé fall in love, but struggle to understand their new romantic feelings. “Chloé’s Judgement” (1961), Marc Chagall. From the Daphnis and Chloé suite. On display at Park West Museum. Throughout the twisting path to their eventual marriage, Chloé is besieged by other suitors, many of whom attempt to abduct her. She is eventually kidnapped and taken to a nearby city where she is saved by the god Pan. Daphnis is also abducted—finding himself captured by pirates and facing numerous trials on his way back to his true love. 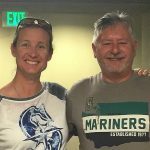 In the end, the couple is reunited and both discover their true parentage. Their story ends happily with the soulmates married and living together in the Greek countryside. 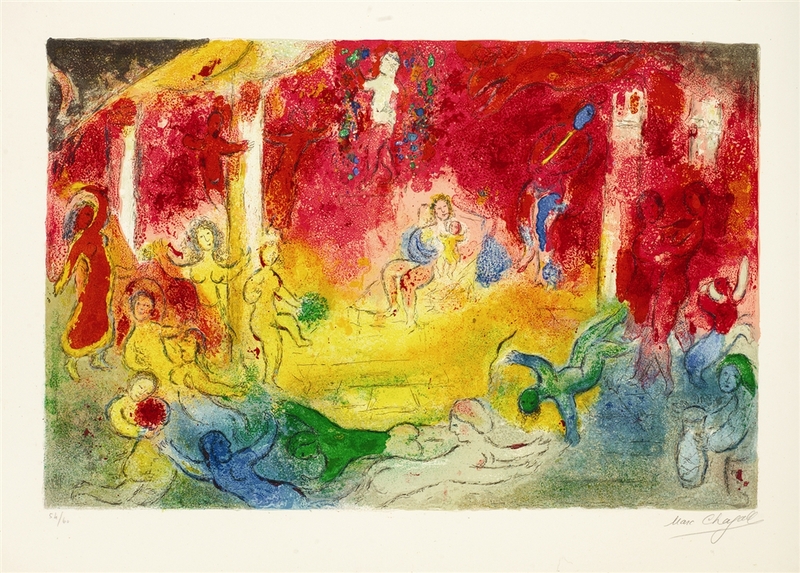 Chagall’s whimsical rendition of Longus’ romantic adventure is heightened by his expressive use of color in each image. The process of lithography requires a complex layering of colors to produce a finished image. In Chagall’s Daphnis and Chloé suite, 20 to 25 different colors were used for each individual image, requiring a great deal of time and precision to produce the final image. The Marc Chagall gallery at Park West Museum. Inspired by his travels in Greece, Chagall created a series of pastel drawings and gouache paintings as studies for his lithographs. He used these early drafts to guide his work with renowned lithographer Fernand Mourlot. 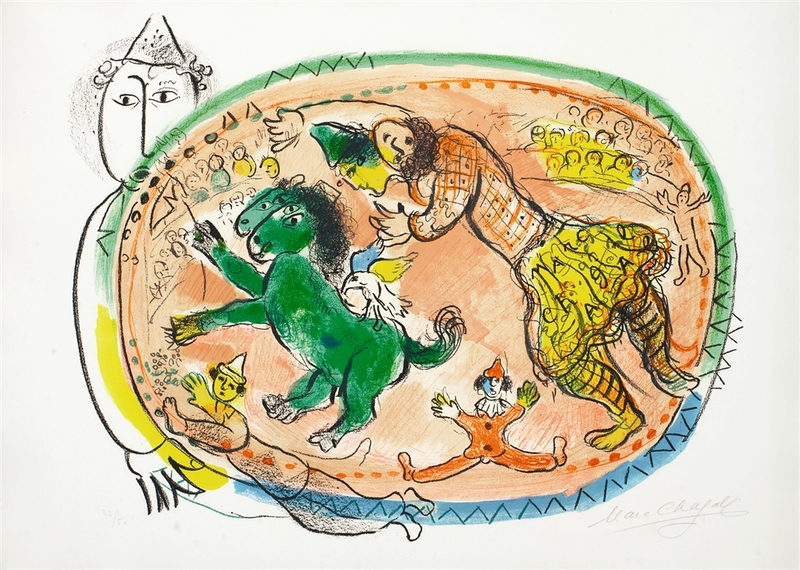 Working together with master printer Charles Sorlier, Chagall’s intricate lithographs were printed at Mourlot’s Parisian workshop between 1957 and 1960. The final result—his Daphnis and Chloé suite—is considered to be one of the most important graphic works of Chagall’s career. When it was finally released in 1961, Chagall was 64 years old. Yet his insights into the colors and emotions of young love would endure forever. 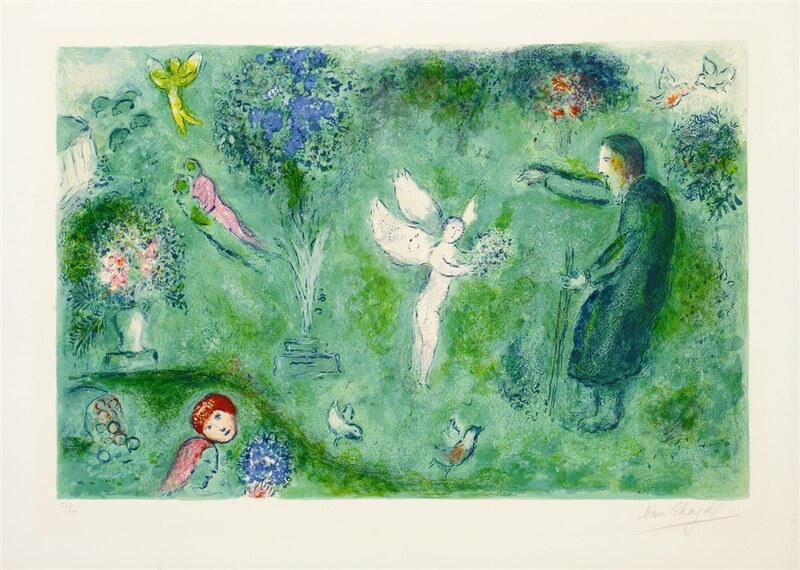 Lithographs by Marc Chagall are currently available during Park West’s Spring Sale. You can view the collection here or contact our gallery consultants at (800) 521-9654 ext. 4 or sales@parkwestgallery.com. 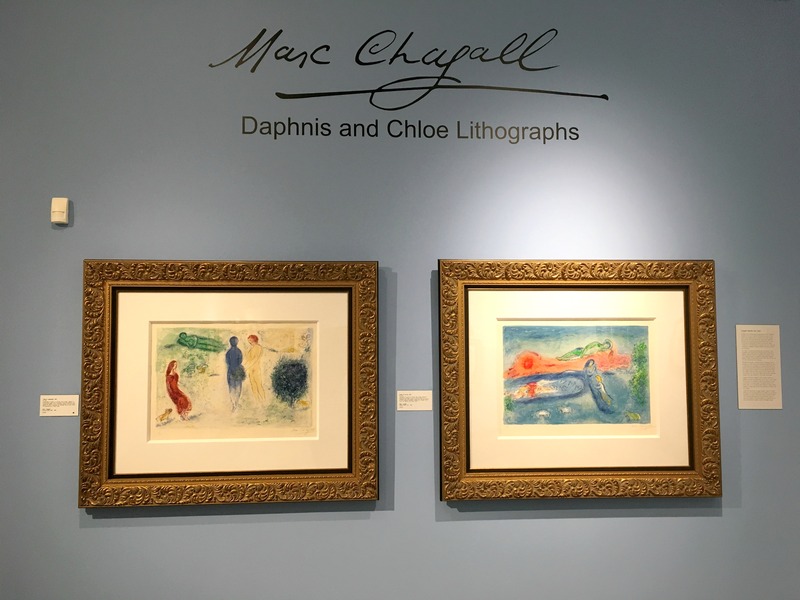 Park West Museum has a gallery devoted to the works of Marc Chagall, including lithographs from his Daphnis and Chloé suite. Park West Museum is open Monday through Saturday from 10 a.m. to 6 p.m. and Sunday from 11 a.m. to 5 p.m. The gallery and museum are located at 29469 Northwestern Highway, Southfield, Michigan 48034. Love Marc Chagall, my all time favor artists. I love the stories behind his work. Love the Art Museum in Nice, France of Marc Chagall works. I got to get to Israel to see his last works. Love that man! I also love Marc Chagall, still kicking myself for not buying one of works I seen while on a VIP cruise.Planing a trip to Israel next year.